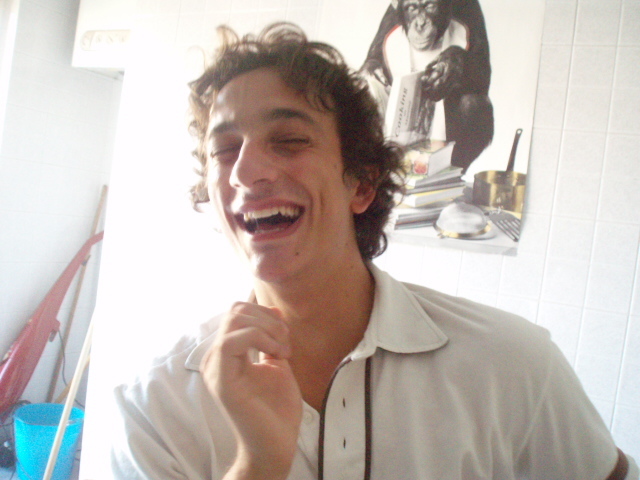 Gigi is studying medicine in Foggia but he goes back to Angri every now and then to see his family. But he can’t stay there for long because Angri makes you angry hahaha well no that was just a running joke from the cultural exchange… Anyway here we are, good old friends reunited. 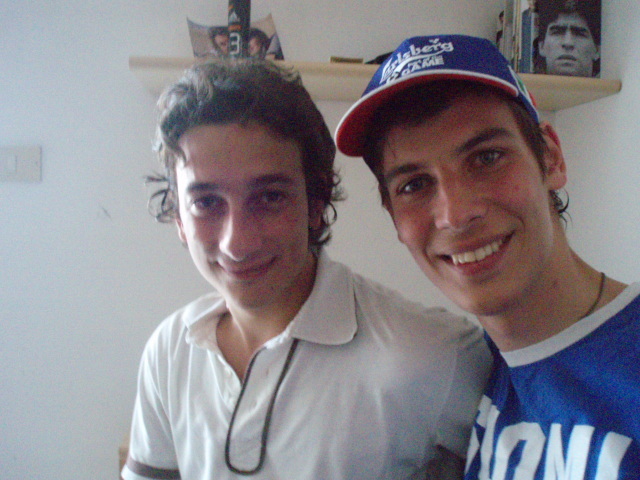 In the evening we visited a Neapolitan friend and had a great time (as always with Neapolitans;), got to listen to a lot of some wonderful Neapolitan and what made it even better was that there was a football game going on (Turkey-Croatia which ended dramatically in Turkey’s favour). 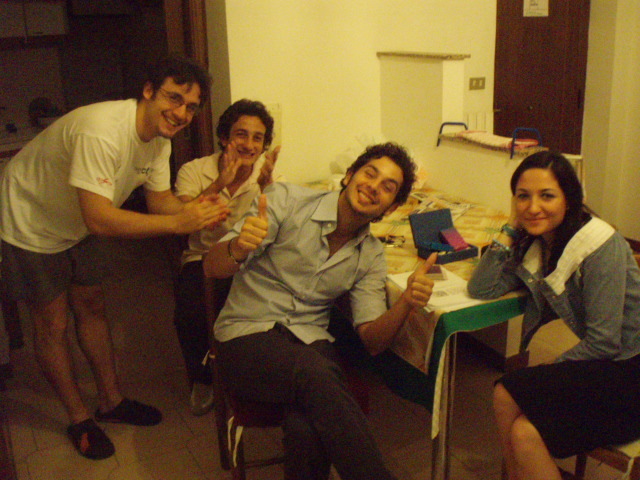 We also met some other Foggia friends and at the end of the evening I entertained them with some magic tricks. 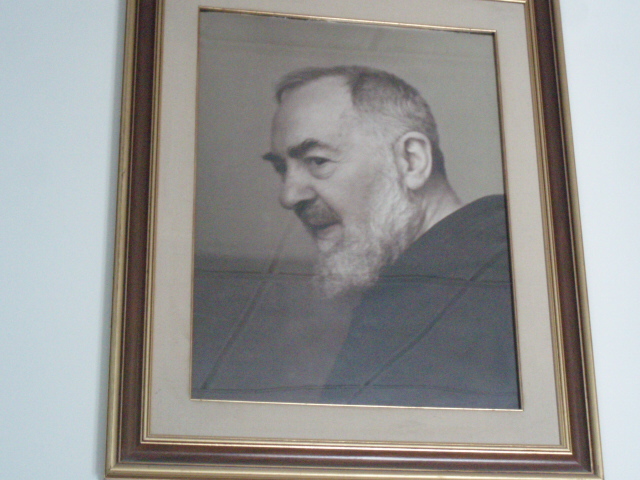 I’ve read a biography of Padre Pio by German Lutheran pastor Ruffin, called Padre Pio (The True Story). It’s very good and recommendable, and the fact that it’s by a Lutheran makes it better not worse – the approach is very appropriate and it’s very readable. 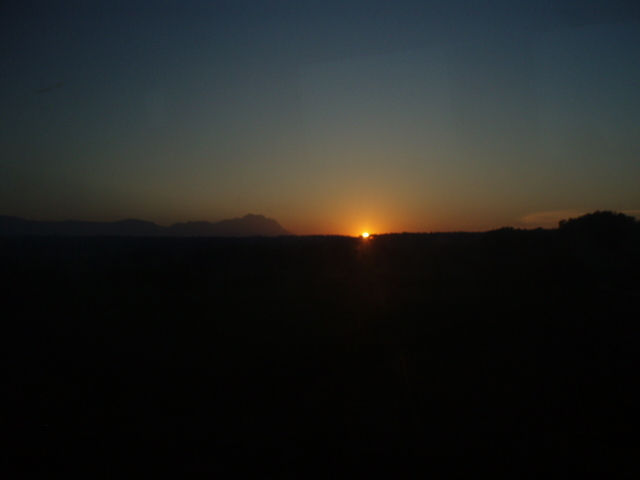 So I was eager to see all the places I’d read about in real life, and much of them I did see. 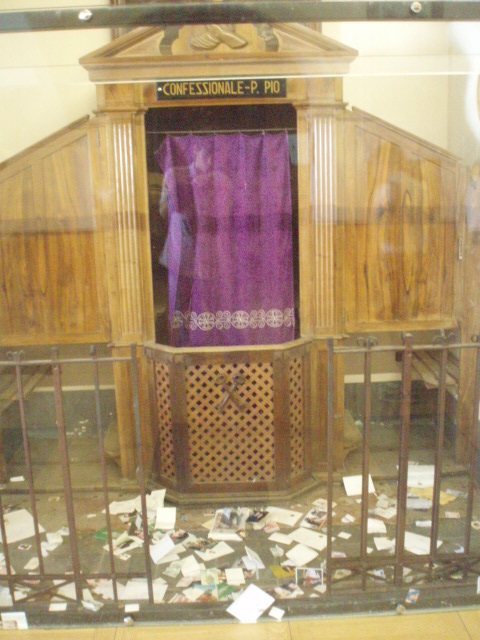 Here is Padre Pio’s confessional. 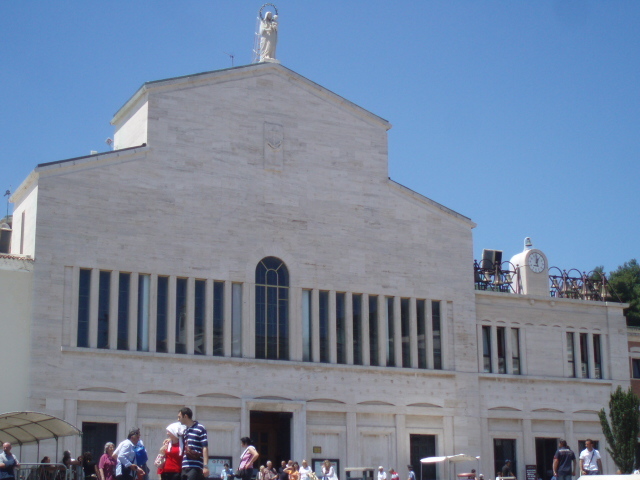 He was such a popular confessor that the queues were long and intense – sometimes there were fights and one woman even got a big trauma from the ”pie donne” or pious ladies that were always wanting to be near Pio – someone actually threatened to kill another person for jumping the queue for confession… talk about perfect contrition. 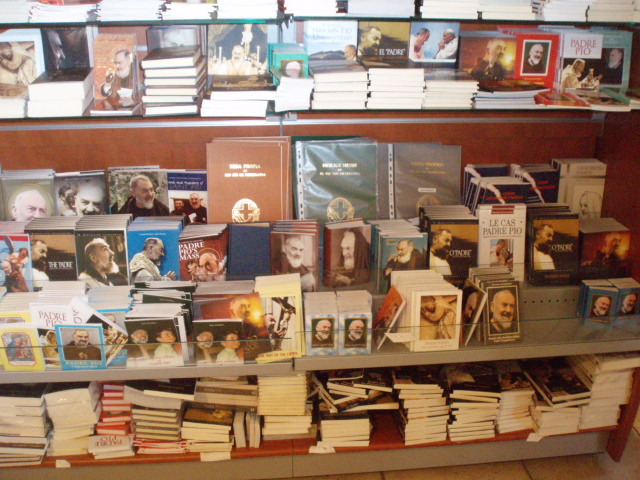 People would also try to cut pieces off Pio’s habit (the religious vestment) as he passed by, and all kinds of little stupid things were being sold and/or distributed for popular religiosity such as cloth dipped in animal blood claiming to be relics of Pio’s stigmata. Yes, it’s crazy, but it testifies to one fact: there must’ve been something extraordinary about this man. 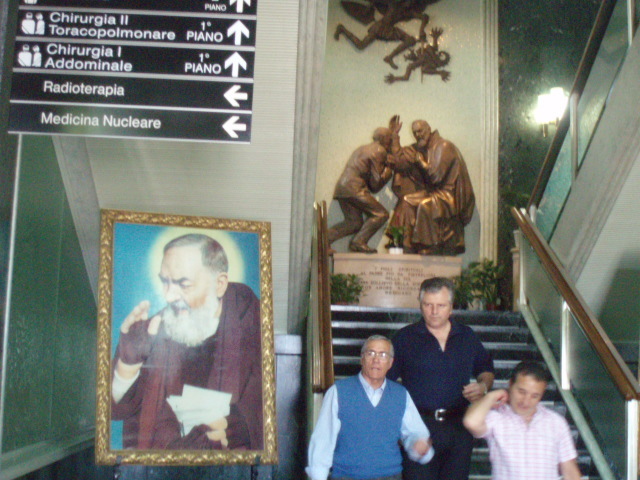 This is the Church Santa Maria delle Grazie where Padre Pio used to say Mass. 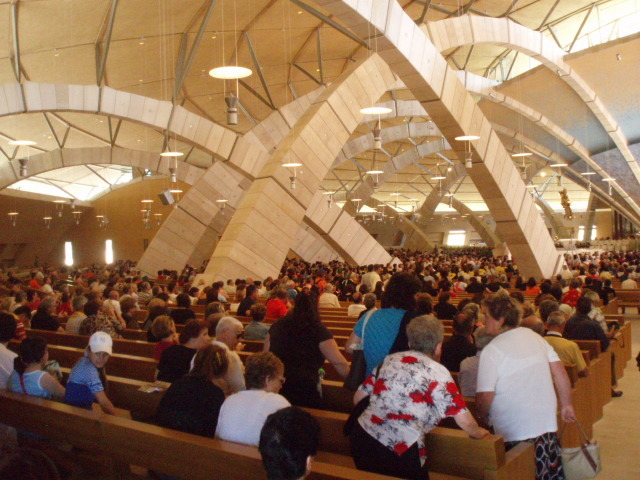 People flocked into his Masses and found it extremely spiritual, they really sensed Christ’s presence and so wonderful it was both for them and especially for Pio that his Masses could and did easily take hours. Actually his last Mass can be viewed on youtube. The well documented stigmata disappeared from his hands a bit before his death and there is no sign of them anymore. The interior of the same church. But as you probably realise by now, the flow of pilgrims after his death in 1968 has been so enormous that there was soon a need to build a new church, a huge modern church for the Masses for the masses:) The new sanctuary is where I too went to Mass and also confession downstairs where there was a whole special hall with a lot of doors with confessors. 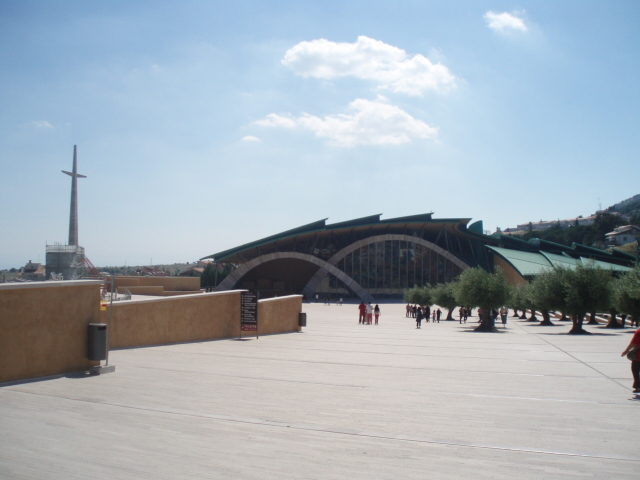 Then there was the Casa Sollievo Della Sofferenza. 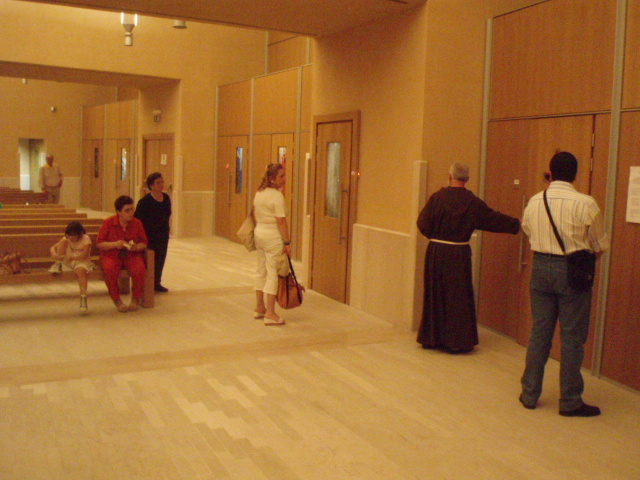 This is a religious hospital initiated by Padre Pio – an immense project of charity, actually a miracle. 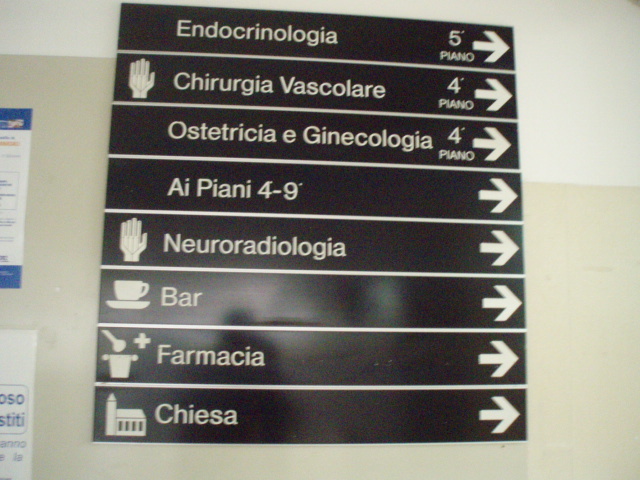 It is now the second best hospital in Italy. The goal is to take good care of the body but also the spirit – have a look at these pictures to see how professional medicine and devotion come together. 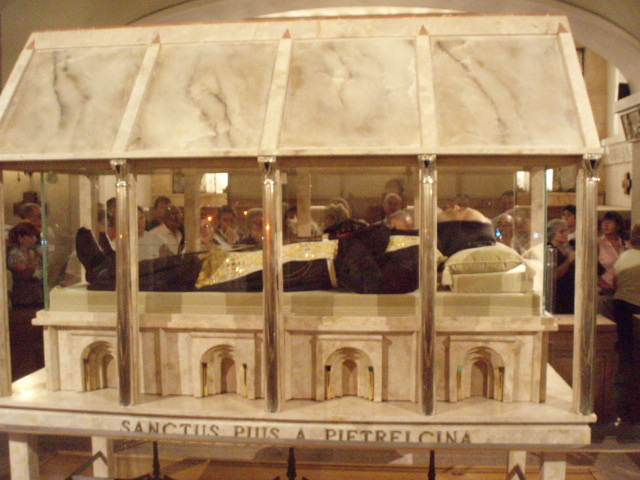 Then there was the exposition of the body of Padre Pio. I visited at an opportune time because from March till December his body is exposed for veneration now that it’s the 40th anniversary of his death. 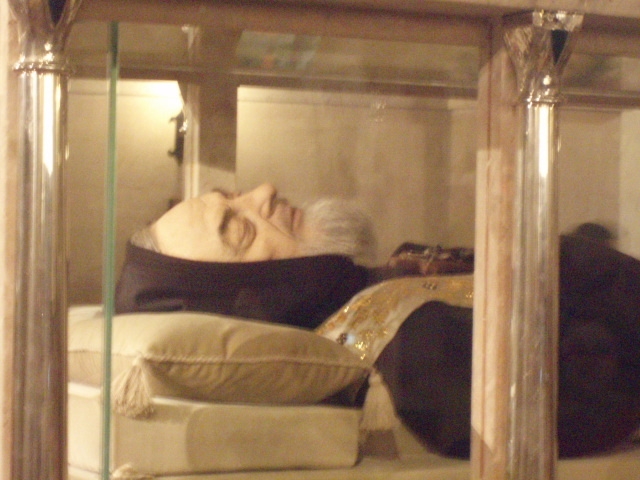 Unlike some cases where saints’ bodies have been found miraculously preserved (See eg the book ”The Incorruptibles), Padre Pio’s body was injected with formalin prior to his burial and after the exhumation a silicon mask was put on his partially skeletal skull. There are different opinions on this exposition, but here it is. After seeing the body I also got to see the crucifix in front of which he received the stigmata, a huge bookshelf full of his letters and his room, all behind glass though, naturally. 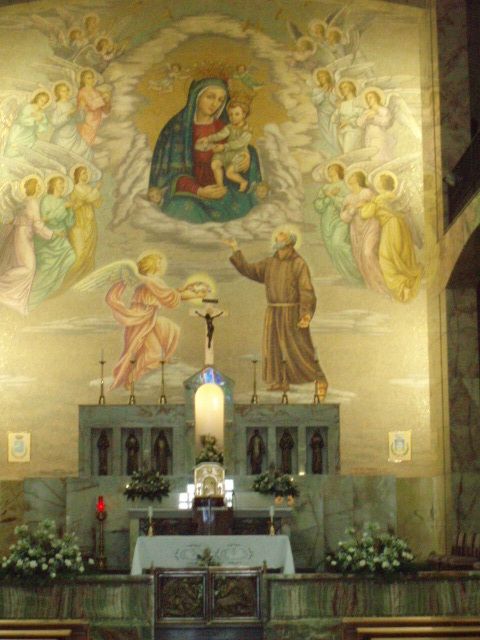 Then I spent some time praying in the chapel of the Blessed Sacrament (which was, unfortunately, less popular than, say, a statue of Padre Pio in the tourist/pilgrim centre area) and reading, and at around 5 pm my bus to Rome arrived. 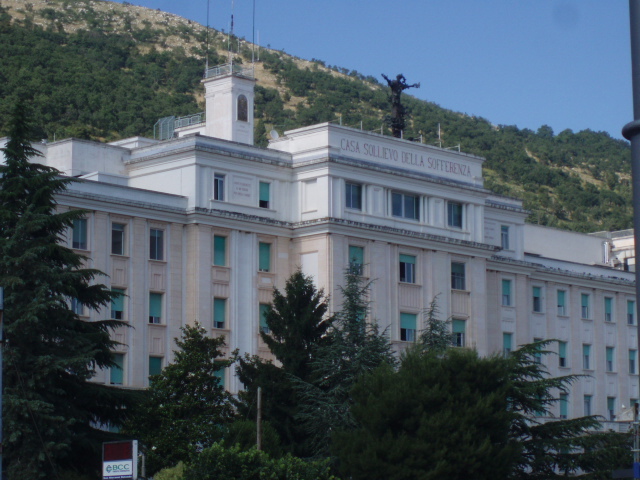 I got my luggage from the surveillance room – there was no ”deposito bagagli”, I asked some cleaners where I could leave my luggage, they said the surveillance room but there they didn’t agree. 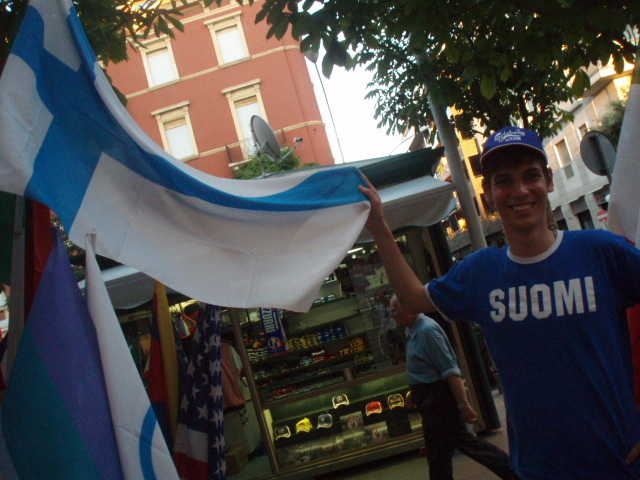 After some debate they consented and started asking where I was from and wishing a nice day. Kategoria(t): Kirkko, Matkat, Ystävät. Lisää kestolinkki kirjanmerkkeihisi.